I know. I bought a jp150 and just got the email it's on the way. I can't wait. "Loaded on truck for delivery".....c'mon already! Hahahaha, I've been there it's been a long time, but I feel for you all. Hmmm... Great minds think alike! Did you by chance get the pink one off Reverb? That thing was gone in a flash. Pink, yes... though I saw it on EvilBay first... and that’s where I transacted. Pink ones are very rare for either Tribute or EVH. After a quick check with seller, I didn’t hesitate. My purple tribute has quickly become my #1... hoping this one is equal in tone/playability. They call me Flash for a reason! Haha. Awesome. It was a bit out of my price range at the moment, but I think it was one of the better looking pinks I've seen. Of course... the guitar arrived to Chicago this AM... and I am just left away on business until Friday evening! This was more than I wanted to spend as well, but have not seen one in excellent condition (in pink) any cheaper! Nice I always loved the purple on the Axis. 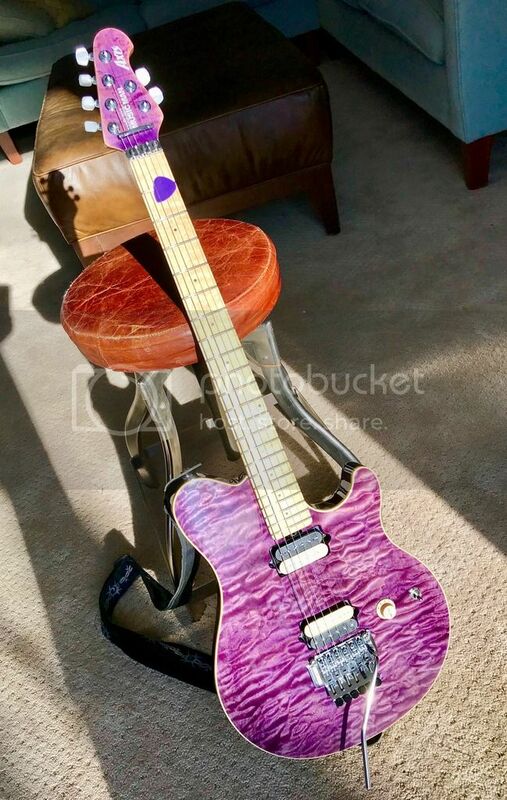 EVH's purple model guitars what drew me to EBMM. Nice one. Purple is on my shortlist, too. Ah, a purple Axis Tribute. Outstanding! Here’s my purple people eater... pinky is going to have big shoes to match! Can’t wait to get home and find out! Last edited by Flash Gordon; 08-16-2018 at 02:22 PM.